Mordecai refuses to bow before the king. MONG THE PRINCES at the royal palace in Shushan was a proud man named Haman. He was very rich, and clever, and he knew how to behave in the most pleasing manner whenever he appeared before the King. So the King honored Haman above all the princes, and commanded all his servants to pay respect to this proud man. Among the King's servants who sat in the gate of the palace was Mordecai, the Jew. 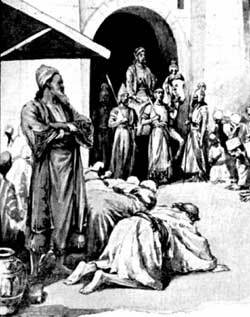 And whenever Haman passed through the gate the King's servants were supposed to bow down before him, with their faces in the dust. And they all did so except Mordecai. He would not bow down before any man to give him the honor that belonged to God only. The King's servants were not pleased when they saw that Mordecai refused to bow down before the honored prince. They asked him why he dared to disobey the command of the King. And Mordecai told them that he was a Jew; and doubtless he told them that the Jews worshiped God only and would not reverence a man as if he were a god. Then the servants hurried to tell Haman of Mordecai's unwillingness to bow before him. Haman's pride was deeply wounded when he heard Mordecai, the Jew, refused to give him honor. He became very angry, and determined to punish Mordecai. But he thought that because he was such a great man it would look petty to punish only one Jew; he must resort to some great form of punishment. So he planned to kill all the Jews. He did not know that Esther, the beautiful queen whom the King loved, was a Jewess. Now Haman helped to rule in the great kingdom of Persia, and he often came before the King. He thought it would be an easy matter to get the King's consent to have the Jews killed. And he planned carefully, that Ahasuerus might not know he was angry with the Jews because Mordecai would not bow before him. Then he came to the King and said, "O King, there is a certain people scattered throughout your counties whose laws are contrary to your laws and they refuse to obey you. They are different from other people and they are unprofitable to our kingdom, therefore if it please you, let a law be mad that those people be destroyed. And I myself will pay the money to hire soldiers to kill them." Ahasuerus did not know much about the Jews nor their strange religion. He did not know that his beautiful queen was a Jewess. And he supposed that Haman, his great prince, knew all about the people who were so unprofitable to his kingdom, so he told Haman to write letters to the rulers in every part of the kingdom, telling them that on a certain day they should destroy all the Jews in their part of the country, every man, woman, and child. After the letters were written, Haman gave them to postmen, who carried them to every part of the kingdom. Then he believed he had done a great deed that would bring him much honor, and he went to the palace to dine with the King. He felt that no one in all the realm of Persia was quite so important as himself, for even the King allowed him to do just as he pleased. Soon the news of this letter reached the ears of the Jews in every part of the land. And they wondered why Ahasuerus had suddenly become so displeased with them. They had always lived peacefully among his people, and had never given him any trouble. They had worked at honest toil and many of them had become very rich. Now they were to be destroyed and their riches were to be seized by wicked men. They could not understand why this cruel law had been passed against them. And everywhere they wept with loud cries, tearing their clothes and dressing themselves in sackcloth. Many of them sat in ashes, and mourned and fasted and prayed. Mordecai was among the first of the Jews to hear about the cruel law; for he lived in the city of Shushan. And he knew at once that Haman had made the law. He knew that even Esther would have to suffer death if the law were obeyed, for every Jew was to be destroyed. And his grief was very great. Tearing his garments, he wrapped himself in sackcloth and threw ashes upon his body. Then he went out into the streets and cried with a loud and bitter cry. But he did not dare to pass through the king's gate, for no one was allowed to enter the gate when dressed in sackcloth. And he could not come near the palace to send a message to the Queen. He hoped that Esther might hear about him, and send a messenger to learn why he was so deeply troubled. Then he would tell her all about the cruel law, and then perhaps she could think of some way to help them and save their lives.